Once I’d recovered from the horror of the opening episode of the latest season of The Walking Dead (as much as one can ever recover from that! ), I admit to growing more and more frustrated with the rest of the episodes. Having to introduce so many different communities often left me feeling unsatisfied at the end of each week, with very little actually happening to move the overall story forward. Rock In The Road was therefore a welcome return to form and a start that I hope signals the next half of the season is going to go from strength to strength. Crucially, this mid-season premiere picked up the pace, as we finally see Rick and the Alexandria gang preparing to make a stand against the Saviours. Clearly, this being The Walking Dead, this action is bound to end in death for some (please not Daryl or Michonne! ), but it’s the only way forward for the characters and the series and I’m excited at what lies ahead. It was fantastic to see Rick and the characters we’ve grown to know so well meet and interact with other communities (their reaction to the tiger was fun) and with Daryl in hiding at The Kingdom, hopefully we’ll see new alliances starting to form. It’s clearly not going to be easy for them to convince others to fight, with the threat of a close encounter with Lucille hanging over their heads and it will be interesting to see on which side of the fight these communities and indeed individuals within them will choose. Charcter-wise, Andrew Lincoln as Rick Grimes has always been one of the biggest assets to the series and was the reason I started watching in the first place. We’ve been through a lot with Rick and his period of resignation to Negan’s rule was beginning to grate, so thank god he’s getting back to being the leader he has always been. Tom Payne as Jesus is also fast becoming one of my favourites this year and I hope I’m not getting attached to someone with a short life expectancy! I had been hoping to see the original gang (especially Daryl) reunited with Carol this week, but hopefully this will happen as the season unfolds. It was also fascinating that Morgan hid from them that she isn’t actually that far away. As for set pieces, this episode treated us to one of the most visually impressive scenes in the series to date, as Rick and Michonne dispatched a multitude of Walkers all in one go, using just two cars and some wire. If only getting rid of Negan was that easy! However the most intriguing part of the episode was what has motivated Gabriel to drain their supplies and run? He has always been weak, but it did seem out of character when he had finally started to step up recently. However, after rewinding the opening scene, I noticed that he wasn’t alone in the car as he drove away from Alexandria, so perhaps he is likely being controlled by others, possibly the group introduced in the final moments of the episode. I’ve never been a fan of Gabriel, so if this storyline gives him a bigger role and purpose, I’m all for it. Thankfully, after the recent run of dull episodes, Rock in the Road suggests that perhaps the series is taking a turn for the better. I admit I’m dreading the inevitable losses that are to come, but I’m excited again about this series and look forward to seeing what the writers have in store! The Walking Dead season 7 continues in the USA on Sundays on AMC and in the UK on Mondays at 9 p.m. on FOX. You can watch the promo for the next episode “New Best Friends” here. Another week, another fantastic episode of Suits, as episode 6.14 successfully moved the multiple strands currently running in this sixth season along, as we head ever nearer to the season finale. The most striking thought I had after watching Admission of Guilt was how well balanced an episode it was. There were wonderfully light, fun moments, lovely emotionally meaningful moments and lots of drama and tension, so much so that I was biting my nails by the end! It was Suits at its best, reminding me of earlier seasons, as we watch the legal manoeuvrings ping back and forth as people’s true motives were revealed (let’s face it, wasn’t it obvious that man had more at stake than his marriage?). The main focus was Harvey and Mike’s pursuit of a legitimate case against Velocity Data Solutions, in order to achieve their ulterior motive of getting Mike a hearing for admission to the Bar. It’s a storyline that enables us to enjoy all the aspects that made the series a hit. Harvey is back being the brilliant tactician he is, finding a way to bend the circumstances to his (and by default here, Mike’s) advantage. Whether it works or not remains to be seen, not to mention the fact he seems certain Mike will come back to the firm, while Mike seems committed to not doing so! Plus how will Mike react if Harvey no longer intends to take the lawsuit forward, if he really cares about those workers? There is also some wonderful interplay between Mike and Harvey, which reminded me how much I’ve missed the two of them together playing scenes like these. 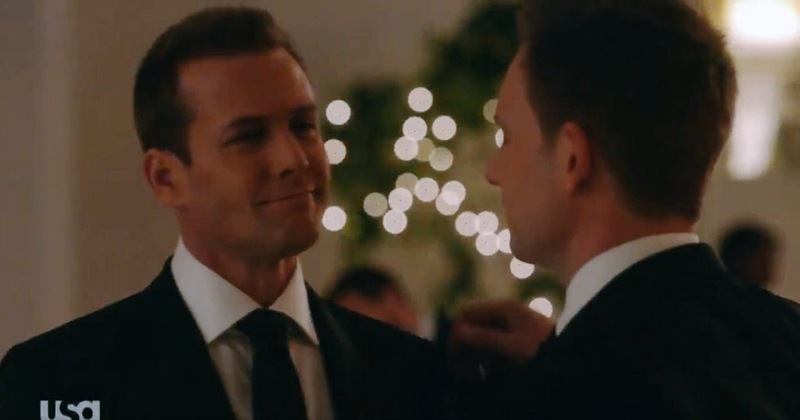 Their partnership has always been the cornerstone of Suits and it was great to see Gabriel Macht and Patrick J Adams delivering more of their characters’ banter. We were also treated to another successful partnership between Rachel and Katrina. These two characters have had a rocky history and yet they now respect each other and proved to be a strong team. In an episode focusing primarily on the case and Mike, it was lovely that there was time given to furthering Rachel’s personal journey too. She has always been determined to be a success in her own right and make her father proud of her. Seeing her reaction to someone telling her how much he admires her professionally was a lovely, emotional addition to the episode. Added to that, we also don’t seem to have to worry about Mike and Harvey’s actions jeopardising Rachel’s career now that she will be being admitted to the Bar. Louis’s personal development also continued this week and the more he grows, the more I see him as the logical choice for Managing Partner. This week saw Harvey putting Mike ahead of the firm, letting Louis down and putting his career and reputation (and therefore that of his firm) at risk. In the meantime, Louis continued to try and keep the PSL ship steady. Yes, his plan failed, but he did try and was this another predictable show, it would have been a success. It will be fascinating to see whether he does end up heading the firm in the future. His relationship with Tara continues to grow too, although I remain sceptical, and can’t help thinking she’ll ultimately break his heart. Their conversation about having more children was quite telling, as her cleverly worded response suggests to me that the topic of children may end yet another of Louis’s romances. Rick Hoffman has spoken about Louis either growing in season 6B or regressing and I genuinely hope I’m wrong that things won’t work out for him. Then there was “The Donna.” I remain unconvinced by this storyline. 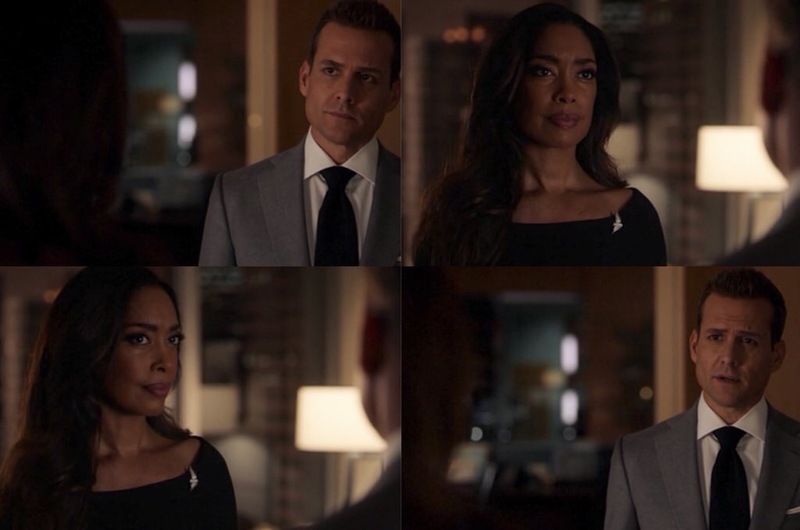 I love the light relief it brings to the show, especially when the stakes are so high everywhere else and it did produce some fun moments this week, with Harvey being introduced to another Donna and Donna receiving a pep talk from her electronic self. However, it still feels rather superficial and to some extent trivialises the character of Donna and everything that makes her such a special part of the series. I know creator Aaron Korsh has spoken about Donna’s arc growing in to something that makes her think about what she wants from life, so I’m keeping my fingers crossed that I’ll be converted before the end of series and that this brilliant character isn’t let down. What is already clear though, is that the writing staff are creating a hugely satisfying back six episodes to this season and I’m intrigued to see what lies ahead for the family of PSL. I’m always impressed how unpredictable a series Suits is. With two episodes left, we still cannot be sure what will happen. I’m starting to get a little concerned that something bad is brewing for them, but I love that the writers continue to twist and turn the storylines in order to keep us guessing! Is it next week yet?! At the end of January, one of my current favourite television series returned with the second half of its sixth season. In the run up to its return, I decided to go back to the beginning and was reminded just what a fantastic series it has always been. If you haven’t given Suits a try yet, now is the perfect time to dive in! Hopefully this post might just convince you. Suits had a simple premise when it began in 2011. In episode one, hot shot lawyer Harvey Specter (Gabriel Macht) is forced by his mentor and his firm’s managing partner Jessica Pearson (Gina Torres) to hire an associate to work with him. This is not an appealing idea to Harvey; he works best alone. 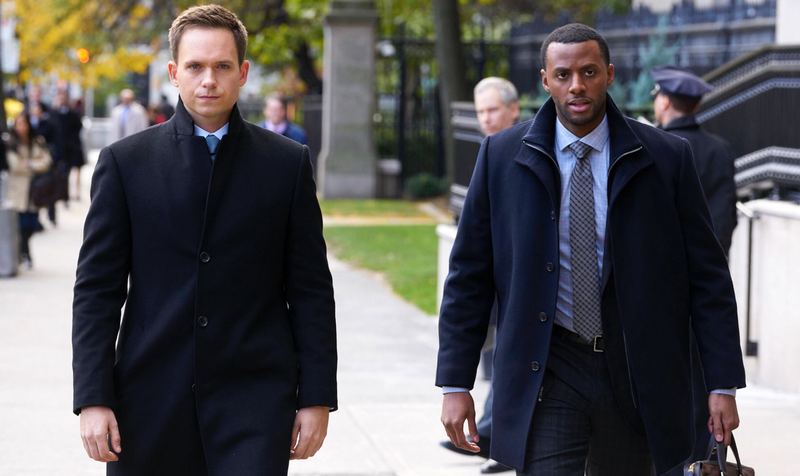 Under duress, he holds interviews with one dull character after another, until he meets Mike Ross (Patrick J. Adams), whose dream to go to law school was derailed and yet despite not finishing college, let alone going to law school, he is the most promising candidate by a mile and Harvey hires him regardless! Yes, it would never happen in reality (I hope not anyway! ), but it’s a clever basis for a legal drama, as we watch the relationship develop between Harvey, known for his confident, selfish, detached attitude and his young protege. Indeed, the more we watch, the more it becomes clear that it isn’t just Mike who is benefitting from his new life, as he is clearly good for Harvey too. 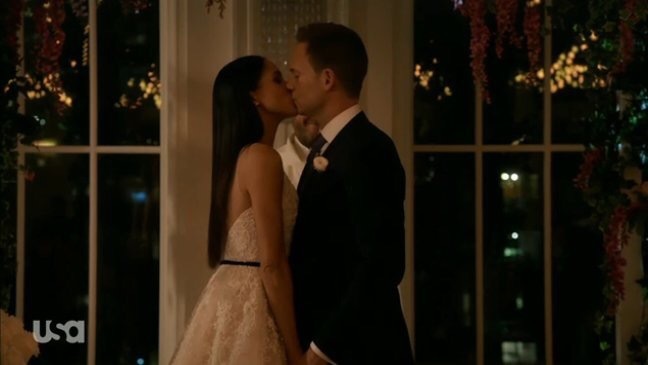 The biggest strength of Suits and the reason it has become one of my favourite shows, has always been its core set of characters, whose lives and relationships we follow throughout the series. 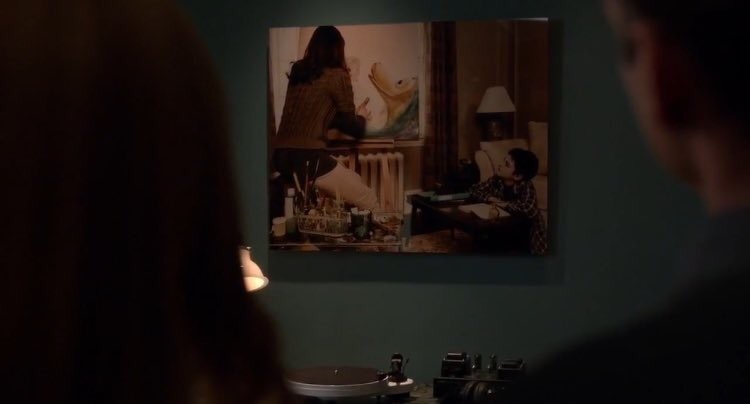 As well as Harvey, Mike and Jessica, there is fellow partner Louis Litt (the brilliant Rick Hoffman), whose frequent clashes with Harvey provide comic relief, but also more dramatic moments too along the way and paralegal Rachel Zane (Meghan Markle), a young woman determined to be a lawyer herself and to whom Mike is attracted immediately. Finally, there is the awesome Donna Paulsen (Sarah Rafferty). Although she is Harvey’s secretary, she is so much more than that and it often seems that she is the backbone of the firm, providing both professional and personal support to all of the others at one point or another over the years. That the three female characters in Suits are all strong, confident women is another factor that makes the series stand out and television today. Creator Aaron Korsh and the team of writers have always been able to strike the right balance between serious drama and comedy, something that differentiates Suits from other modern legal dramas such as The Good Wife. In an episode, you can have moments of serious conflict between characters, while a much lighter story (usually revolving around the glorious Louis Litt) runs in parallel and yet both work because of the quality of the writing and acting. I don’t want to say anything that gives significant plot points away, but despite the series now being in its sixth year, it is constantly finding a way to be refreshed by the writers. Indeed, there have been storylines that have happened, more than once, which have shifted the entire balance of the series, giving it a new lease of life and direction. This certainly hasn’t remained simply a show about a guy pretending to be a lawyer and one of the most exciting aspects of being a fan of Suits is wondering what road the characters will find themselves taking next. The individual cases (and sometime story arcs) are important of course, but the series is driven by the characters and their relationships with one another. You’ll find yourself liking all of the core six for different reasons. Donna is witty, strong, intelligent and loyal to the end, able to read Harvey (and indeed Louis) like a book and I’d go as far as to say she is one of the most well-rounded female characters on television at the moment. Louis will drive you crazy, but you’ll still have a soft spot for him as the show goes on. Jessica is the strong, feisty, boss. I love that it is a woman in this position of power in the world of corporate law and how she is able to keep everyone else in line. She also has an utterly spectacular wardrobe! Rachel is the woman determined to be a success in her own right (not because of her successful lawyer father), but who also has a kind and generous heart, especially with Louis, as well as having great chemistry with Mike Ross and Donna. Patrick J Adams does a superb job making Mike a genuinely decent guy. Yes, he is being dishonest by pretending to be a lawyer, but it’s clear he could have been one. 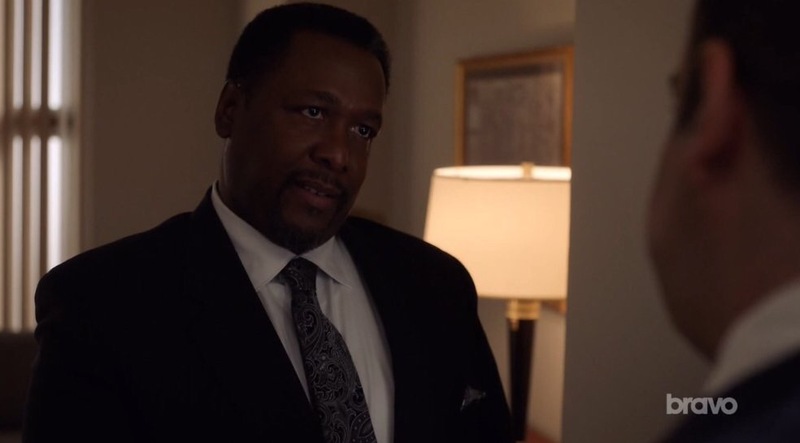 He has the intelligence and indeed the talent and despite the lie that starts him on this journey, he is one of the most moral characters in Suits. If the audience didn’t like Mike, I don’t think the series would work. The other crucial success of the show is the character of Harvey Specter and his relationship with Mike. Gabriel Macht continues to do a fantastic job of bringing quite a complicated man to life on screen. Those who say Harvey is simply an arrogant, flashy, corporate hot shot haven’t been paying attention. Yes, he is an excellent lawyer and he knows it (and wants everyone else to know it too); yes, he looks great in a tailored suit and has a to-die-for penthouse home, but there’s much more to this man and peeling back those layers is one of the most fascinating elements of the show. Over the series, you learn about the issues in his past that drive him and only an actor as good as Macht could so subtly over time develop him. You may not even realise just how much he changes until you go back to episode one and that change all begins with his decision to hire a fraud. As Donna says later, it gives him someone he needs to protect and Harvey and Mike’s brotherly relationship is the foundation of the series. 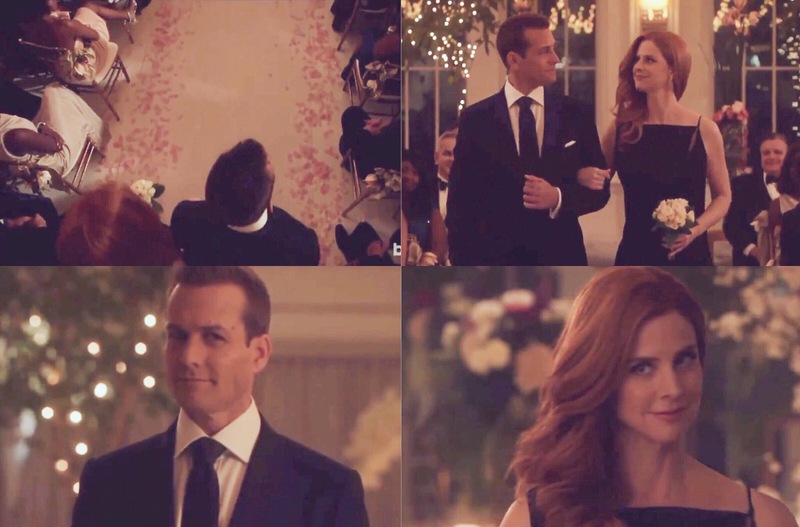 The other relationship I have a huge soft spot for is that between Harvey and Donna. 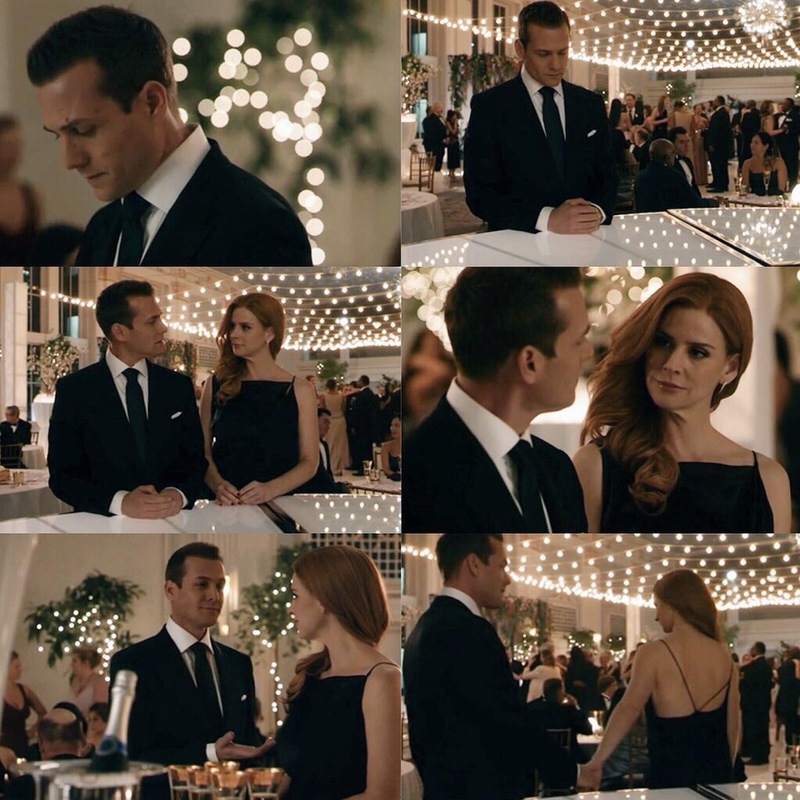 Gabriel Macht and Sarah Rafferty have a fantastic chemistry on screen (no doubt helped but the fact they have been good friends for over 20 years) and the result is one of the best partnerships on television. They remind me a lot of the dynamic I loved between Mulder and Scully and just like I did 20 years ago with them, I can’t watch Suits now without hoping that Harvey and Donna ultimately end up together! It’s a relationship of trust, respect, support and indeed love and I know I’m not the only one who thinks they belong together. I’ve touched on the writing of the show already. Aaron Korsh has around him a fantastic writing team, who six years on, are still delivering a show that is interesting, fun and full of development. Indeed the latest episode (which airs tonight in the UK on Dave) is packed full of character development, which will only help shape the future storylines. 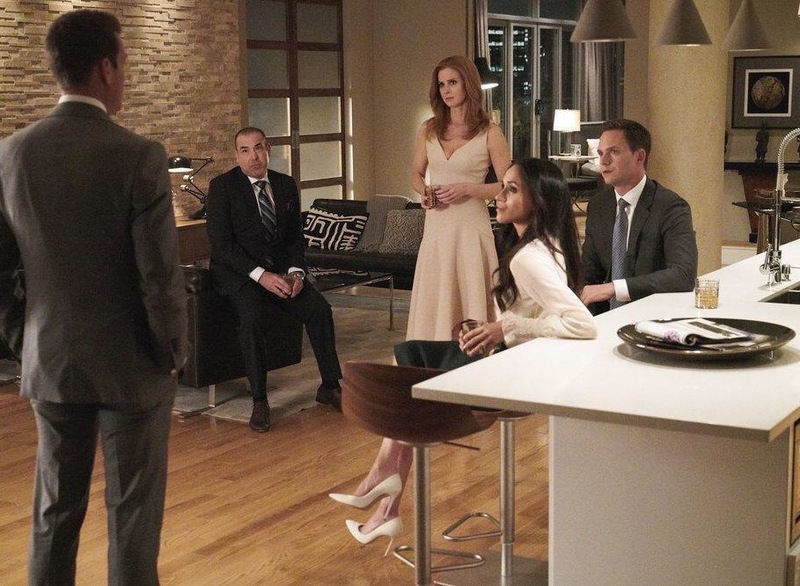 When Suits started, I imagined the likely final endgame – would Mike get caught or not? It’s thanks to the writers that the series has become so much more than that and full of possibility! Visually, it looks great too. It’s always fabulously lit, is jam packed with incredible fashion (they all look fantastic in Suits, it’s so annoying!) and I’m constantly impressed with how well Toronto doubles for New York. Then there’s the music, which is a mix of original score by Christopher Tyng and individual songs, which always perfectly match the emotional moment on screen. I have Suits to thank for so many new artists now on my playlist! Where to catch up – what are you waiting for? So, have I peaked your interest? It is, after all, still winter time, when staying in with a good television series is hardly a bad thing! Plus, if you are new to Suits you have plenty of material to keep you going, with 88 episodes waiting for you! I know that here in the UK Netflix has seasons 1 – 4 and all of the series is on Amazon Video (albeit not all of it on the free Prime service), or there’s always iTunes or DVDs for seasons 1-5. If you catch up quickly enough, the remaining five episodes of series 6 will continue on Dave on Sunday nights at 10 p.m. I’m planning to review the remaining episodes, so look out for those here over the next month. If you do start watching, I’d love to hear what you think, or if you already watch, feel free to give your own thoughts on the show in the comments. As for me, I think I’m off for another rewatch!